Bicycle touring is a great way to take a green holiday! Cycle touring can be fun and relaxing and a great way to see a foreign country – or even just your own neighbourhood. There’s nothing quite like freewheeling down a country lane and watching the sun dappling the clouds and trees as you spin along. Bicycle touring is so very much more do-able in counties which have taken the trouble to include bicycles in their transport plans. Places where the road network includes good lanes for bikes and separate bikeways where the traffic is busy include Holland, Germany, Belgium, and Denmark. Other counties such as France and Britain are starting to slowly catch on. There is not space here to detail all the different countries and evaluate their road networks from the viewpoint of cycle tourists. Fortunately there are several good websites that can offer some help. I’ll list some below, at the bottom of the page. I recently holidayed in Holland and north Germany and found that the experience was enjoyable and even relaxing at times. We went taking camping equipment with us – very small, compact camping gear – which was fine but probably we would have had more time for exploration and relaxation if we had used guest houses and hotels. We also spent a lot of time trying to get places (we were aiming for Denmark). In the end we ran out of time and had to content ourselves with a few days in northern Germany, followed by a train ride back to Holland. 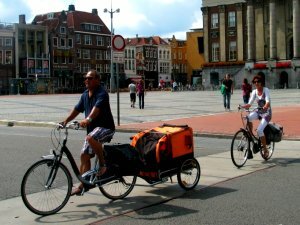 One of the great things about bicycle touring in Holland is that you continually meet other cycle tourists and see how they do things. We met quite a lot of families who were traveling by bike to get to their holiday destination. Some of them were even traveling hundreds of kilometers. Some had complex arrangements of tag-along bikes and bike trailers to make it possible for them to carry all the necessary gear for their holidays. We met two large families - comprised of women and lots of young children - from Zwolle in the Netherlands who were trekking up to the coast to spend a couple of weeks together on the islands. In Holland these things are very practical! We also met a young dad who's daughter was travelling in a child carrier - and he still had all his camping gear in panniers, too. Of course, it helps that Holland is largely flat but he and his daughter seemed relaxed and happy. This kind of thing is still pretty much impossible for anyone venturing out onto the roads of Britain – our bike routes are just not good enough yet. Sustrans is working hard to change that! I haven't used their long distance routes yet but they certainly look promising. If you are going to try cycle touring, make sure that you are reasonably fit to start and if you have any health problems run the idea for the trip past your doctor before you commit to it. Which bike for a holiday by bike? Picture: A good trailer can work well for bicycle touring - or shopping! You also need to make sure your bike is up to the job. You also need to be sure that your bike has the right kind of gear. Good lights are essential. Good quality panniers and bike racks are highly desirable. Some bikes are purpose built for touring but almost any good road bike or mountain bike will do the job. Touring bikes are made with a slightly longer wheel base and some also have more clearance between the road and the chain set. The longer wheel base helps with balance and distributing the load of the panniers. Whatever bike you select, make sure that it is well-maintained and is a good fit for your size and preferred riding style. Strong and efficient brakes are also a must when you are riding a loaded bike. A front detachable top-box is a great asset for maps and valuables. This sits on the handlebars between the brake and gear arrangements. A bicycle bell of some kind is also well worth having. Pedestrians and slow moving cyclists often fail to hear bikes approaching from behind. A quality lock is also a must. Bike theft is surprisingly common in Holland, for example. Don’t forget to kit yourself out with decent maps if you can. In Europe many of the maps produced in Germany are particularly good – but you need to understand German, of course. 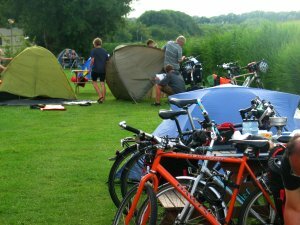 If you are camping and cycle touring you do not normally need to book ahead. Most campsites in Holland, for example, have an area reserved for small tents. However, in the peak season it is as well to book more popular sites ahead as being turned away from the only campsite in the area is a dispiriting experience, especially if evening is drawing on! Lightweight equipment such as down sleeping bags and self-inflating sleeping mats are an asset. Adventure Cycle-Touring Handbook, 2nd: Worldwide Cycling Route & Planning Guide is a pretty comprehensive guide - written by people who have done it! This book has been praised for its down-to-earth, jargon-free style as well as for being a good practical guide to what to buy. Bike Touring: The Sierra Club Guide to Travel on Two Wheels (Sierra Club Outdoor Adventure Guide) This is a compact and well-organised book that has something for even the seasoned cycle tourist, as well as for newbies. Touring by bicycle is taking off with new routes and cycleways springing up in many countries. Here in the UK Sustrans is slowly transforming the long distance cycling experience and we even get some tourists willing to try a holiday by bike in England, despite the hills and our famous weather! Sustrans works for more sustainable transport and is developing a national network of cycling routes with some off-road provision. They also supply maps of cycle routes and have details of accommodation. There are now over a million journeys a day (by bike and on foot) on Sustrans routes! 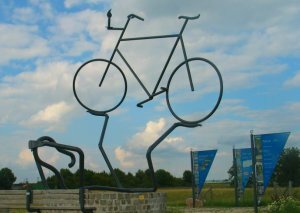 CycleRoute.com has a cycling forum and details of routes that others have tried. CTC – The Cyclists Touring Club organises tours and campaigns for better provision for cyclists. There are maps available online for members and membership includes many discounts on ferries and cycling gear. The European Cyclist's Federation promotes cycling in Europe and beyond. The League of American Bicyclists does a lot of advocacy work on behalf of cyclists in the US.Their mission is "To promote bicycling for fun, fitness and transportation and work through advocacy and education for a bicycle-friendly America"
The Adventure Cycling Association The USA has a growing network of cycle routes which you can learn about here. Cyclotour.com mainly specialises in cycling guides, including some for France as well as the USA and Canada. Warm Showers offers hospitality for touring cyclists - something like couch surfing.